The trail from Postojna to Mašun is like a forest highway, but with little cars. It’s a fast and OK hike. I caught quite some rain, but there were some abandoned (or empty) houses along the road. Some had patios, which I used to hide from the rain. Since it was a weekend’s day Mašun was fully booked. I asked if I could camp in the front garden and they then showed me the summer bar (a tiny shed), in which I could sleep. 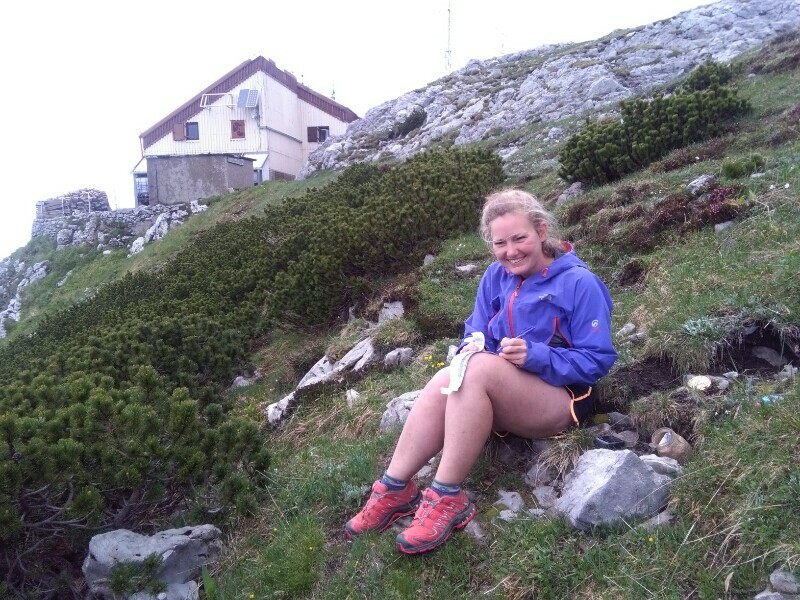 The next morning I heard a heavy sound, as I was walking towards Snežnik mountain. Then I saw something brown and fluffy running. It moved fast away from me and it moved like a dog (and not like a pig). 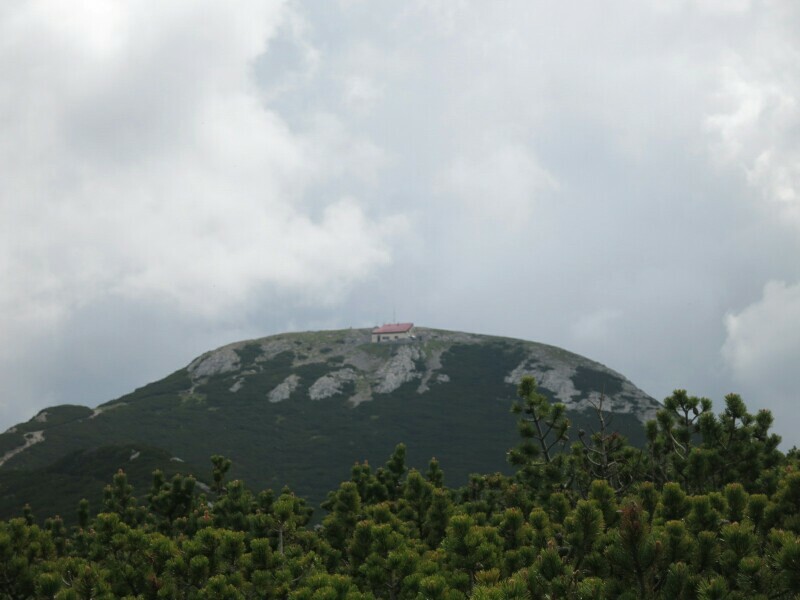 The climb to the top of Snežnik isn’t very demanding, it’s a pleasant walk and not many hikers take the Dinarca-route. Parts of the of trail are a bit overgrown (or need maintenance). On top there’s this very, very nice hut. It’s open in the weekends and on Sunday until four in the afternoon. Hikers can stay for the night and they serve (good!) food and drinks. If the weather is good, it’s possible to overlook the whole of Slovenia. Because it’s an easy walk up, it’s a popular hike among Slovenians (and Italians). Both in summer and in winter. On Snežnik I met Iztok, he’s a regular visitor and loves to explore this mountain. We went to search for a geocache to put my travelbug (Reise(ver) in. Iztok was happy to help, since this was a new discovery on the mountain. Mission accomplished: TB86F83E is on it’s way! He blogs about the mountain and also wrote one about our meeting, check this link (in Slovenian). Through Iztok I got invited to have supper with the staff of the hut. Katia (and the other lady’s name I forgot, shame on me) are really good cooks and so friendly. They did not let me pay and sent me on the way with a home brewed pear-schnapps and good luck charm. Thank you! I left the Dinarica and took a shortcut to Babno Polje through the forest. Since there’s serious forestry going on, it’s not a very inspiring hike. But, it shaved off quite a few kilometers from, an also uninspiring, hike over a main road. That evening I camped next to an English couple who were out on tour with their oldskool Landrover for a few weeks. They invited me for tea and a beer, to which I off course could not say ‘no’. After entering Croatia I got myself Croatian money from the ATM and bought some snacks from one of the small, but well stocked grocery stores in Prezid.